A hard-fought point away at in-form Leatherhead means that Lewes's Play-off hopes are still alive going into the final three games of the season, reports Stuart Fuller. Manager Darren Freeman was able to name the same side that beat Merstham last Saturday and the Rooks started the game in a similar fashion to how they ended last Saturday, looking to get wide-men Charles Banya and Harry Read in behind the Leatherhead full-backs. The home side soon settled into their rhythm, hitting long balls up to their front two, whilst the Rooks looked to get the ball down on the ground and play football. In the 10th minute a neat move that saw Banya get behind the full-back, pulling the ball back to Ben Pope and he rolled the ball into the path of James Hammond, who turned and slotted the ball home to give the Rooks the lead against a team who had kept five consecutive clean sheets. The home side were rattled and a rash challenge of Ben Pope saw centre-back Nnamani the first player to go into the referee's book. However, the Leatherhead player made amends a few minutes later, taking advantage of some confusion in the Lewes penalty area from a corner and pushed the ball past Carey to equalise. The Tanners were in the ascendancy and looked more likely to grab a second rather than The Rooks. Carey made two superb saves in the space of a minute, one with an outstreched leg, the other getting his body behind a string from distance. As half-time approached The Rooks went on the front foot with Banya again causing all sorts of issues for the Leatherhead defence. In the 40th minute his run and cross found Harry Reed unmarked at the far post and his goal-bound strike was headed off the line by Salmon. Two minutes later Omarr Lawson danced through a couple of challenges but his shot flew wide of the goal. Freeman was forced to make a change at half-time with Ben Pope receiving one whack too many in the first half and he was replaced by Ola Adeyemo. Despite Leatherhead's pressure, they failed tio really trouble Lewis Carey or the back three who won header after header. Kieron Pamment was brought on to replace a struggling James Hammond with twenty five minutes to go and he soon had a golden chance, forcing Oualah into a flying save from a free-kick 25 yards out. 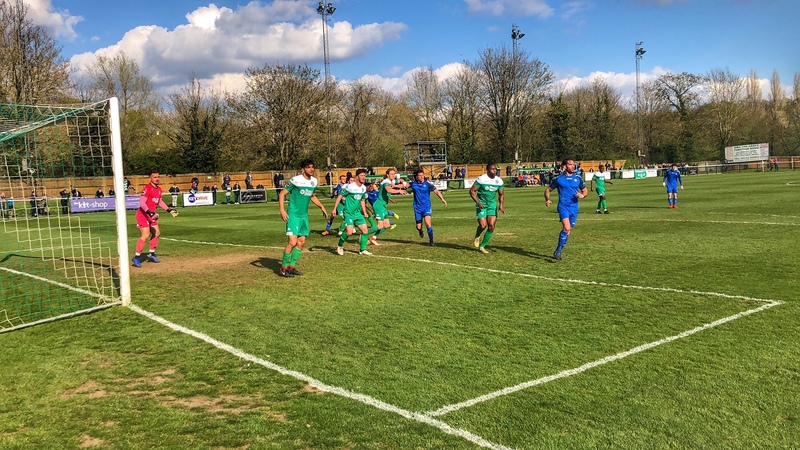 With the game heading for a draw, Leatherhead's Shaun Okojie had a golden chance to win all three points after a slip by Tom Day saw him with the ball at his feet and a clear sight of goal from just ten yards out but he pulled his shot wide. Despite a few half-chances on the edge of the Lewes penalty area in injury time, a draw was a fair result and left both sides still in with a chance of grabbing a Play-off spot with just three games to go. After the match an upbeat Darren Freeman spoke to Barry Collins about the game. The Rooks now face a must-win game next Saturday when they host 7th placed Bishop's Stortford at The Pan, kick off 3pm.